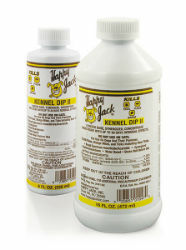 A water-based, environmentally friendly concentrate that provides 30-day residual control of fleas, ticks (including deer ticks), lice, mange mites and stable flies. Effective and economical, it can be used as a dip, a sponge on or a premise spray. Mix 1/2 oz. per gallon of water as a dip or sponge on or 4 oz. per gallon of water as a premise spray.